Bellevue Place | Cary Kopczynski & Company, Inc.
Bellevue Place is one of the largest mixed-use projects in the Pacific Northwest. It consists of five separate structures, including a five-level subterranean parking structure for 1500 vehicles, the 21-story Bank of America Building and the 25-story Hyatt Regency Hotel. Also included is a six-story office/health spa building and the Wintergarden, a six-story glass enclosed atrium with retail on two levels. Restaurants and specialty shops in the Wintergarden connect the Hyatt Hotel and Bank of America Building. 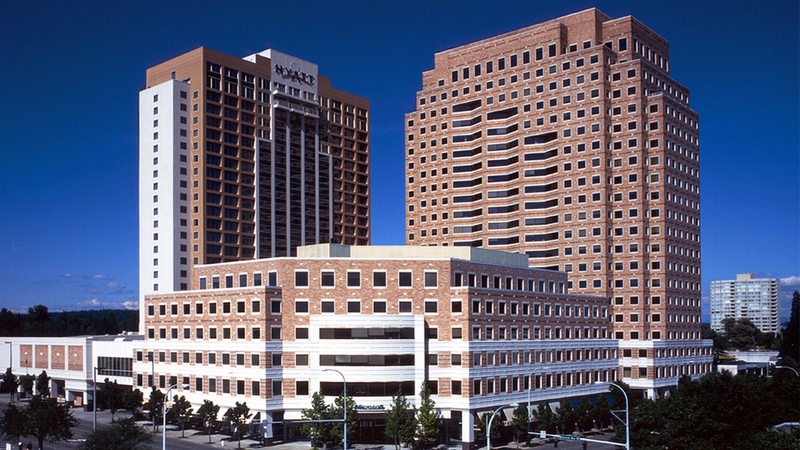 CKC worked on a 20-story Hyatt Regency Hotel tower expansion with five levels of below-grade parking. The project also features a 100,000 square foot ballroom, meeting rooms, offices, exhibition hall, retail and restaurant space. The tower's lateral force resisting system combines shear walls and ductile frames. Common area framing consists of composite structural steel, with roof trusses spanning 120 feet.